When I was living in Qatar I had made my friendship mostly with local guys. It was a festival of some kind in Qatar and two of my cute friends came over to my flat with something still hot as I nearly dropped the package they handed me. They said for me to taste it. The appearance of this food didn't look very appetizing but it reminded me of "chicken pot pie". Harees is made from some ground up wheat and cooked with chicken to a kind of paste or like a dumpling or... chicken pot pie consistency. 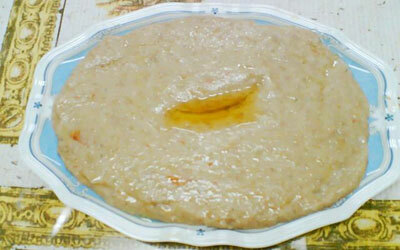 It is something eaten as a local food in the Arab Gulf/ Persian Gulf. I also had a very good Omani friend who raised camels for one of the royal family members. He and I went around various places and was very influential for me to learn more about how Camel raisers are like. When I visited him he made me wear dishdasha, an Arabic "thobe" like gown if you will ( with no undershorts underneath!) and he would let me try camel's milk which he just squeezed from the camel! It somewhat resembles goat milk and has a very gamy and wild animal smell to the milk, but I really enjoyed it- UNIQUE ! I found out that camel's milk is helpful for diabetics too! He got me acquainted with the more agricultural world in Qatar, we went around Qatar in a pick up to various عزبة around the country, and hanging out with "shabub" in those areas- I miss those old days.